Sam, Grace and the Shipwreck is an evocative and compelling true story about the daring rescue of the passengers and crew of the shipwrecked SS Georgette off the Western Australian coastline in 1876. Stockman Sam Isaacs is out with his horse tracking stray cattle when he suddenly hears the cries of shipwrecked people in the wild sea off Calgardup Bay. Sam gallops back to the homestead to tell the Bussell family (whom he works for) what has happened, and their young daughter, Grace Bussell, races out and jumps on her horse. With ropes in hand, 16-year-old Grace Bussell returns with Sam to see what they can do to help. By this time, most of the lifeboats were breaking up in the rough sea. Urging her horse into boiling surf, beyond a line of roaring breakers, Grace and Sam reach the boats where the women and children are in great peril. With as many women and children clinging to Grace and the horse as possible, she makes for the shore, landing them safely. Sam and Grace do this over and over again until they’re exhausted. It took four hours to rescue 50 people. Sam Isaacs and 16 year-old-Grace Bussell performed amazing acts of courage. They were awarded medals from the Royal Humane Society for their efforts and Grace's legend lives on through the name of the coastal hamlet of Gracetown, north of Margaret River in Western Australia, near the wheat belt town of Lake Grace. It’s quite dark at times, and you can definitely feel the ‘intensity’ of the situation and the unpredictability of the rough sea. The illustrations are dramatic and unusual, involving mixed media collages, combining computer generated images with oil paintings. The images are powerful yet perfect for this amazing story. Pitched at older primary-age children, this book should make an excellent resource for teachers and librarians trying to encourage young readers to learn more about Australia’s history. 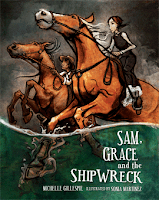 Sam, Grace and the Shipwreck has it all - adventure, bravery, history and horses!